Recently under new management, this three-star hotel features spacious, comfortable rooms. Some boast a private patio looking out onto Place du Ralliement. Located on a pedestrian square, Saint Julien Hotel is a peaceful haven that remains within easy reach of restaurants, shops, theatres and more. 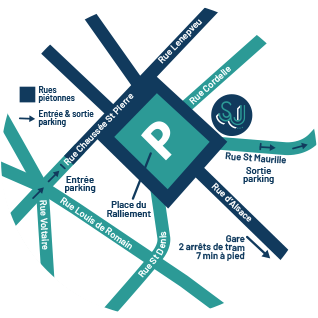 The tram provides easy access to the train station, hospital and university. Stay in a ‘famous’ room at the Saint Julien Hotel in Angers! With a minimum size of 16m2, these ‘famous’ rooms are spacious and pleasant. Indicate your choice of twin beds or a double bed when booking. The team at our charming hotel in Angers will then provide the room of your dreams! If you wish, you can also request a cot. All rooms in this category feature a bath or shower. Whenever possible, we will allocate you a room with your preferred choice. Choose Saint Julien Hotel and enjoy peace and quiet in your ‘renowned’ room. These rooms exude tranquillity and measure at least 20m2. Several bedding options are available (double bed, twin beds, cot, etc.). Please let our team know what you require. Our staff are here to meet your needs. Continental breakfasts are served on the hotel’s ground floor, looking out onto Angers’ central square! Upon arrival, a complementary welcome tray is provided in your room. High speed wifi is provided thanks to fibre installed throughout the hotel. Enjoy Angers’ micro-climate and treat yourself to maximum comfort with this legendary room. Featuring a private patio, it offers uninterrupted views of Place du Ralliement, the heart of Angers’ town centre. No need to worry about traffic noise – this is a pedestrian square! And Saint Julien Hotel is ideally located. With an average size of 22m2, double bed or twin beds, and cot available, this room has many options. Make sure you start your day the right way. Our team will serve you breakfast on the ground floor… with a view! You receive a complementary welcome tray as well.